Since the dawn of organized weapons makers and armies, the purchasing governments have demanded a system for assuring that the products live up to their promised specifications. This practice became most organized, and earned the name of "proofing" with the advent of firearms, when armor plates were proof tested to assure their resistance to (proof against) early gunfire. Though 100% of armor in those early days was tested, this rapidly changed to batch testing, which is what we have now with most firearms. A representative sample of each lot of weapons is tested with a proofing cartridge, which has vastly higher pressure than the normal specifications. If the weapon survives a certain number of these, it passes, and all weapons in the lot get the proof mark to certify they meet the government's minimum expectations of function and safety. Though the US government has inspection processes for military goods, there is no proof house of any sort for domestic US gun makers. Yes, that means there are essentially no standards. Most other countries, do, including Spain. The model S photo to the left shows the typical location and appearance of proofmarks on Star pistols. They are usually on and/or near the front of the trigger guard. There are 3 on a typical commerical arm, and four on a typical military arm. Note that most will not be hilited in white as these are. In fact, yours may be quite hard to find or read. The Spanish government set up a proof house in Eibar starting in 1923. From 1927 onward, the proof mark additionally was accompanied by a letter code, indicating the year of proofing. There are 28 letters or letter-combinations, as explained in the chart below. Every 28 years or so (there are inexplicable gaps) they start a new series, by adding a number to the end of the letter codes. Though there was another one operating for a short time in the early 1920s, Eibar is the one and only Spanish government proof house for most of the 20th century. Although I do not specifically address it, this should therefore work for Astras, Llamas, and any other handgun. I am not sure the same coding scheme is used for long arms, but try it and if it sounds right, it might be. As seen below, there are four possible marks on any Star firearm. Three are proofmarks, and there is a fourth that is a Spanish military acceptance proof. Although many other countries have military acceptance marks as well, I do not know their design; if anyone does know for sure, please send me a good quality photo or other reference information. The three proof marks indicate receipt at the proof house, passing of proof, and the date of proofing. I do not know when the date is added, but note that it is not exactly the date of manufacture, but the date of proof, which is always later. Probably the same year though, so its a good guide. As implied above, with proof date codes, you can get an accurate and reasonably precise date on your Star pistol. Just use this handy translation code list. The first three years of proofing (1927-29) were reportedly somewhat confused, so dates of manufacture may vary widely from the stamped date. Additionally, no proof date code means only "pre-1930" not "pre-1927." As implied above, with proof date codes, you can get an accurate and reasonably precise date on your Star pistol. Just use this handy translation code list. The Spanish government proof house set up 28 letters or letter-combinations that replace years, starting in 1927. There was no proof house in Eibar before 1927. Every 28 years or so (there are inexplicable gaps) they start a new series, by adding a number to the end of the letter codes. 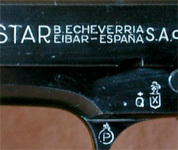 Though this system works fine for the Eibar-based Star, use care when trying to proof-date a gun by another Spanish maker. Other regions have different proof houses with different marks and codes. Proof marks are often very shallow, and in obscure places, like far up the trigger guard. You might not notice them unless looking, under bright light, at low angles. All the examples on this page are highlighted in crayon; yours will not be this visible. Also think like the manufacturer. The proofs are placed before assembly. They may be under the stocks, and on small guns, very often are completely or partly under the grip panels. Pull those off (for many guns, like the Firestar, be careful not to move the safety as a plunger can become dislodged and fly away, lost forever when the grips are off) and look if you have no other luck. At least one reader has a model PD with, apparently, the month and year of manufacture directly stamped on the frame. Note that proofmarks are not highlighted; this has been emphasized with white crayon before imaging. It's still a bit of a mess, but if you are not seeing it, there's the proof house admission seal, the proof house pass seal, large letters apparently reading "T•1" below this. Now, if you look at it sideways, there is a large "6 78" next to it. This is still speculative, as there is no clear X or X1 date code to accompany it, but the pistol is of the style that would have been made in 1978, and the T1 is not an absolutely convincing date code due to size and format. The bullet between instead of asterisk above is something I have not seen. This is also a good example of how hidden proomarks can be. This is not just accidentally under the stocks because it was stamped before assembly, but deliberately along the backstrap portion, very hidden from view unless searched for. Using Serial Numbers to Determine Date of Manufacture? A document sent to me some time ago, and which I just now noticed, is the same sheet as the above table from the nice people at Ipar Guns. At the bottom of it is, however, another note. However, I have not seen this that I noticed, and a perusal of the few post-1995 guns in my possession doesn't seem to indicate it, and of photos doesn't help either. It might appear on the box label, however, so everyone look around and tell me if that seems true.